If you can’t take the heat . . .
Gourmet girl Chloe Carter is keeping busy with grad school and spoiling her best friend’s three-month-old son. Now, courtesy of Craigslist, she has a new job as assistant to cookbook author Kyle Boucher—a job that stirs up painful memories of her ex-boyfriend Josh, who chose the shimmering beaches of Hawaii over a life with her on the mean streets of Boston. 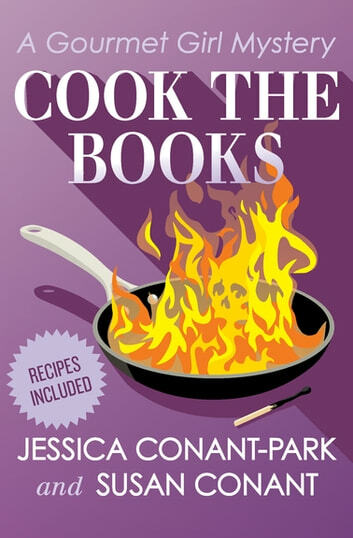 The gig heats up when Boucher asks her to compile a book of recipes from Boston’s top chefs. Chloe leaps from the frying pan into the fire when she arrives for a meeting with Digger, one of Josh’s friends and a rival chef, and discovers a dead body instead. Digger died of smoke inhalation from a blaze that started in his kitchen. Unable to believe that an executive chef would allow a grease fire to get so out of control, Chloe starts an unofficial search for the murderer. As if she didn’t have enough on her plate already, now Josh is back in town. Chloe must decide where her future truly lies, but as a killer prepares to strike again, the amateur detective will find herself racing against time to protect those nearest and dearest to her. Cook the Books is the 5th book in the Gourmet Girl Mysteries, but you may enjoy reading the series in any order.